In the 1970s, Tennessee was among about a half-dozen states that restricted the way high school girls could play basketball. Instead of playing “five-on-five” basketball, girls played on six-player teams in which the three players in the forward position stayed on half the court, and the three guards stayed on the other half. Guards were not allowed to shoot baskets. High school student Victoria Ann Cape set out to change that in a Title IX lawsuit. Her legal fight is chronicled in a book available at Amazon: Full Court Press: How Pat Summitt, A High School Basketball Player, and a Legal Team Changed the Game. Pat Summitt was a newly appointed coach of the Tennessee Lady Volunteers when she testified for Cape in her lawsuit. Tennessee lawyer Bill Haltom wrote the book with law student Amanda Swanson, a former women’s basketball operations assistant at a college in Ohio, according to this press release. Haltom is a former president of the Tennessee Bar Association and a former chair of the ABA Journal Board of Editors. To kick off March Madness this week, we asked Haltom to answer our questions about the book. His emailed answers have been edited. Q: Tell me a little bit about your book. 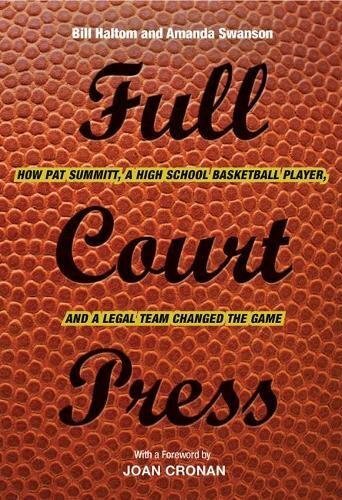 A: Full Court Press is the story of a game-changing lawsuit—literally. Prior to this early Title IX lawsuit, young women playing high school basketball in Tennessee and many other states were not allowed to play the full court game. It was actually considered physically dangerous for young women to run a fast break or even simply advance the ball beyond the half court line. In 1976, 15-year-old Victoria Cape tried out for the women’s basketball team at Oak Ridge High School in Oak Ridge, Tennessee. She made the team but learned to her chagrin that she would play guard, being restricted to defense, and never be allowed to shoot a basket. It was an even bigger disappointment to her father, James, who was 6-foot-6 and had played college basketball at Michigan. His dream was that Victoria would someday play women’s college basketball, which was just around that time moving to the full court game. After trying without success to persuade the Tennessee Secondary School Athletic Association to change its rule, Victoria and her father sued under Title IX, which had just been enacted in 1972. Q: Why did you and your co-author decide to write the book? A: Amanda Swanson and I decided to write the book in the summer of 2016 after Pat Summitt’s untimely death from complications from dementia. We wanted to write a unique tribute to Pat and share the story of one of her greatest victories, not on a basketball court but in a courtroom. Q: What role did Pat Summitt play in this lawsuit? What was the impact of the suit? A: Pat was an expert witness for Victoria Cape at the trial. She was only 24 years old and just starting a coaching career that would include eight national championships and over a thousand wins. Q: You are a big basketball fan, correct? Any March Madness predictions? A: Amanda and I are both avid basketball fans, particularly of the women’s game and, of course, the Tennessee Lady Vols. In the upcoming women’s NCAA tournament, I see Baylor defeating Louisville in the finals. In the men’s tournament, I predict an upset—my Tennessee Vols having one shining moment over Duke for the national title.